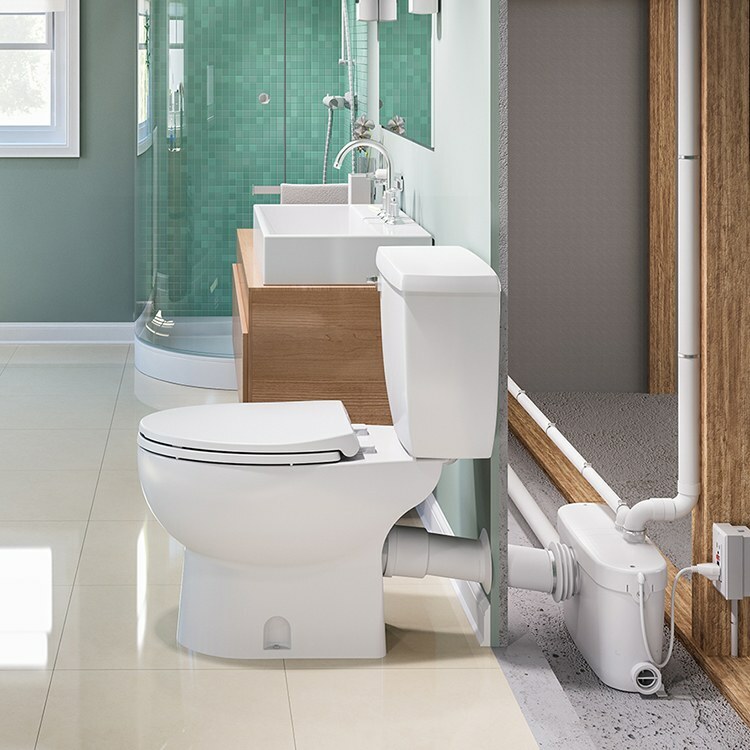 Now you can install a full bathroom up to 15 feet below the sewer line and up to 150 feet away from a soil stack with the Saniflo Saniaccess3 macerating pump. With its powerful .5 HP motor, it can easily handle the effluent from a toilet, sink, bathtub and shower, so you can install a complete bath anywhere with a water and power supply. 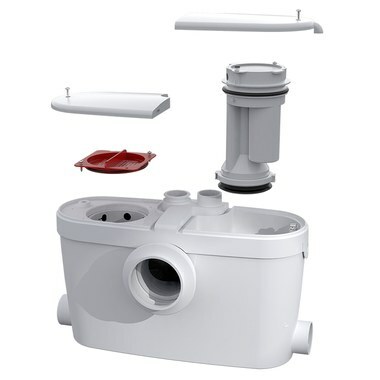 Easy to install, the Saniaccess3 pump requires only four connections: the macerator/pump to the horizontal spigot of a rear-discharge toilet, the toilet tank to the water supply, the pump to a small diameter discharge pipe, and the pump to the electrical power supply. The stainless steel macerator blades rotate at 3600 RPM to churn water and organic waste matter into a slurry that is pumped out the discharge pipe. The unit automatically deactivates once the water is discharged until the flush is activated again. A normal operating cycle takes 10-15 seconds to keep power consumption to a minimum. Easy-access panels allow access to all major components without disconnecting the pump. 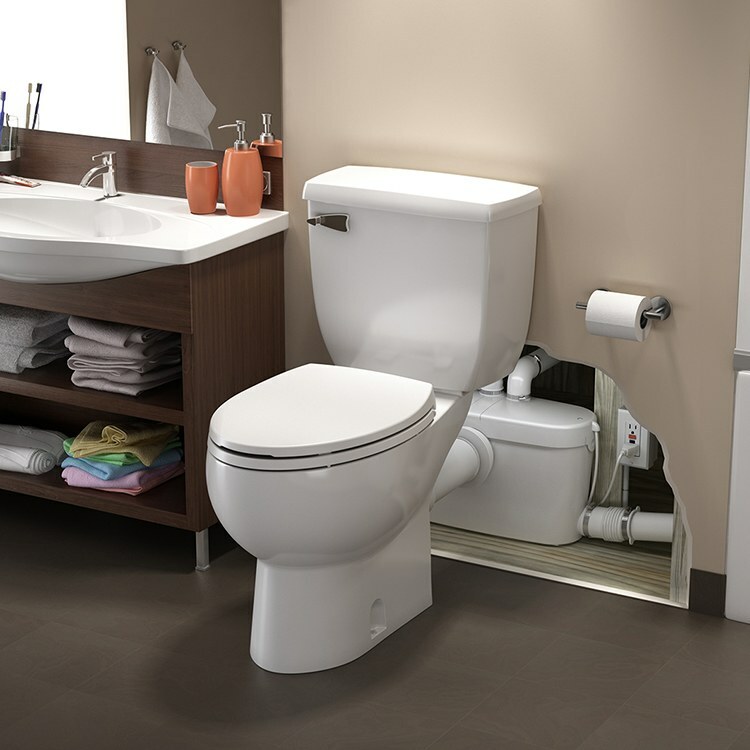 Besides toilet waste, the Saniaccess3 will also discharge gray water from a sink, a bathtub, a shower, and a urinal. It is recommended that the Sanipack be connected to a Ground Fault Interrupter (GFI) circuit. The Sanipack is certified to American and Canadian Standards. Macerating standard; US: CSA Certified & IAPMO (UPC) listed - ASME A112.3.4, CA: Macerating Standard CSA B45.9. Designed for use with Saniflo rear-outlet toilets only. Includes pump only. A toilet bowl (003) and toilet tank (005) must be purchased separately to complete the system.